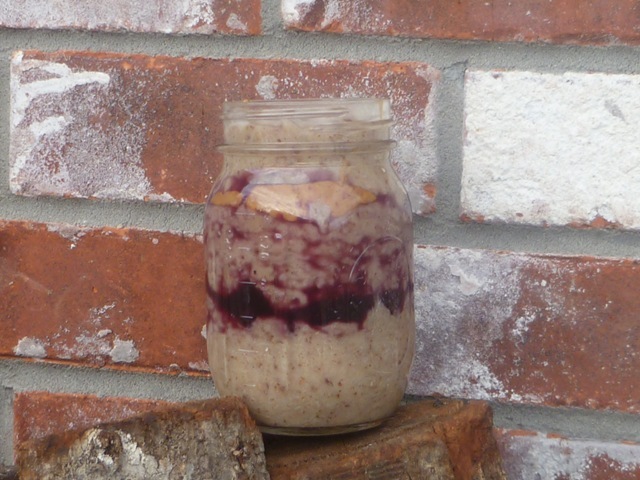 PB&J Oats Parfait – Helen, Naturally! I was able to convince Kohl to lounge around until about 7 – then he insisted on getting up, doesn’t he understand that waking me up in the middle of the night with a temp of 102.8 means I need to sleep a little longer this morn? Not sure what is going on with this kiddo. I thought he was getting much better! 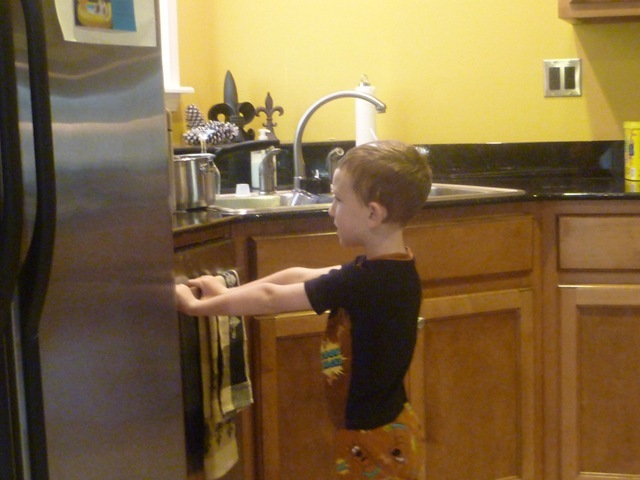 Yes, he is waiting for the coffee to brew. So much like his momma. Before you start wagging your finger at me be assured that he gets a little coffee with his milk, and I DID NOT start this habit! Breakfast was delish this morn. Those steel cuts were calling my name – along with some other super yummy ingredients! Prepare the oats as directed on the package, be sure to whisk through out cooking in order to whip the banana into the oats. Now for the fun part! 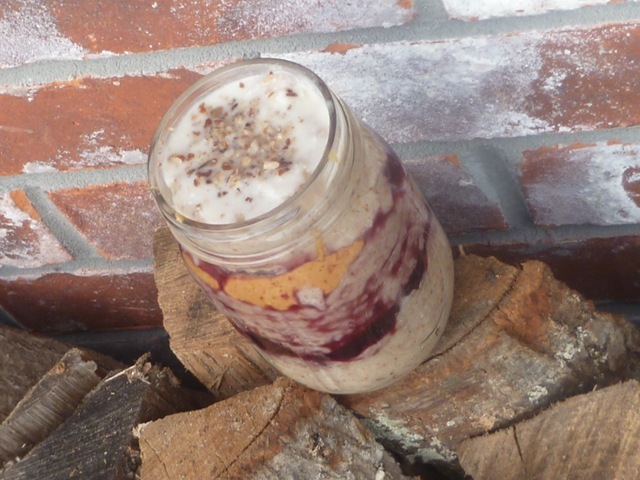 Grab a mason jar and go to layering. 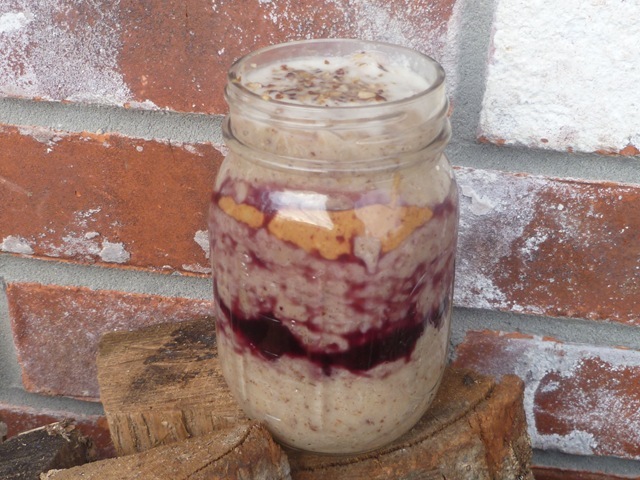 I layered my oats with PB&J. The jelly was a mixture of blueberries mixed with 1T of crofter’s jam. I am planning a visit to my brother’s house for tomorrow, and I am packing lunch with me. He had a big surgery a few weeks ago on his leg due to an old accident. To make a long story short, this is his third surgery from his accident two years ago. The surgery required a bone graph, lots of hardware, etc. So I am going to visit and taking lunch for them. I love “beefing up” my oats with cottage cheese! 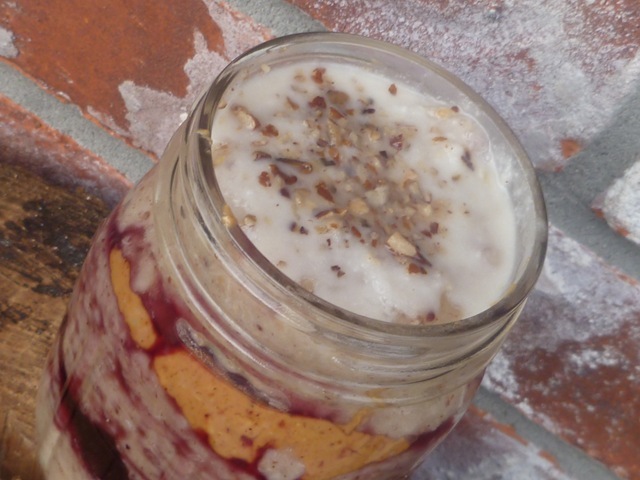 Your oat parfait looks beautiful! Great pics! And I love the background on your blog! Thanks!! The background is a pic of my back yard a few years back…the only real snow we have ever had!! Not much of that in Louisiana. I have really enjoyed your blog as well! he drinks coffee…omg that picture says it all! cute! my dad started drinking coffee as a boy, too. he tells me stories about having coffee and then going out to work on the family farm he grew up on! It is obviously a tradition in our family, we all grew up with “coffee milk”….but my parents are to blame for starting my boys on it!! I started using it for protien source, as well as egg whites, but I discovered that it adds creaminess to the oats as well!